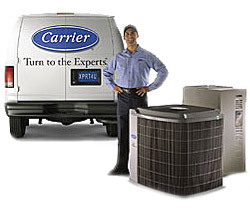 Central air conditioners are more efficient than room air conditioners. In addition, they are out of the way, quiet, and convenient to operate. To save energy and money, you should try to buy an energy-efficient air conditioner and reduce your central air conditioner's energy use. In an average air-conditioned home, air conditioning consumes more than 2000 kilowatt-hours of electricity per year, causing power plants to emit about 3500 pounds of carbon dioxide and 31 pounds of sulfur dioxide. If you are considering adding central air conditioning to your home, the deciding factor may be the need for ductwork. See the section on limitations when replacing existing systems for more information. Today's best air conditioners use 30%–50% less energy to produce the same amount of cooling as air conditioners made in the mid 1970s. Even if your air conditioner is only 10 years old, you may save 20%–40% of your cooling energy costs by replacing it with a newer, more efficient model. New residential central air conditioner standards went into effect on January 23, 2006. Air conditioners manufactured after January 26, 2006 must achieve a Seasonal Energy Efficiency Ratio (SEER) of 13 or higher. SEER 13 is 30% more efficient than the previous minimum SEER of 10. The standard applies only to appliances manufactured after January 23, 2006. Equipment with a rating less than SEER 13 manufactured before this date may still be sold and installed.